The headline is there to draw you in. The article is there to sucker-punch you in the back of the head. This week we'll look at the most egregious headlines of the week, which all come in one flavor: delicious Apple doom. You've read Gilgamesh, you've read Oedipus, now read about a truly epic fail. Writing for The Street, Jonathan Yates brings us "3 Reasons Apple's $90 Billion Share Buyback Is an Epic Error" (tip o' the antlers to Sam T.). Wait, this article isn't a slideshow? That's just leaving money on the table, Jim Cramer. Apple's $90 billion share buyback program is one of the most egregious misallocations of capital in corporate history. In corporate history. Spoken like someone who did not see Catwoman. These funds have done nothing to address the market weaknesses and improve the long term competitiveness of Apple. Sorry, wait, hang on. Someone from Wall Street is complaining because a company is addressing the needs of investors instead of the business? Now, literally, the Macalope has seen everything. The main one is that Apple is moving from a position of weakness, not strength. Yates's definition of strength has to do with who's currently buying into Apple's stock. Wait, what happened to the business? Which brings up the second reason: Apple is responding to speculators, not investors. They may also be responding to employees. 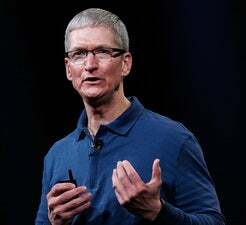 The third reason is that Apple has done little to diversify its line of business or augment its weaknesses, which is what investor pressure would compel. And you know there is no new product line in the works because ... Tim Cook said there was, and it's apparently opposite day. Outside of China and Japan, according to Apple's 10Q, "net sales in the rest of Asia Pacific segment declined year-over-year." That is where the bulk of consumer spending will be coming from in the future. Brazil was up 61%, Russia was up 97%, Turkey was up 56%, India was up 55%, Vietnam was up 262%. Yeah, Apple sure seems stuck in a ditch, doesn't it? Almost two years ago when Apple was around $700 a share, I wrote articles about how the company needed to cash in and diversify by acquiring companies like Sprint and TMobile USA. And, boy, were you wrong. Here's an idea, Apple: Get into a business that everyone hates, in which there is little way to differentiate yourself. Added bonus: You'll tick off the other carriers that sell your devices. It can't go wrong! Apple should light $90 billion on fire and then the whole company should take a month off. Apple should return $90 billion to its shareholders. So, yeah, in comparison the one it picked looks pretty good. They say that clothes make the man, and it's equally true that a ridiculous headline makes for more traffic. Let's look at a couple of examples. Over at Seeking Alpha, Don Dion asks Has The Apple Fallen? Is it irresponsible to ask? No. It is irresponsible not to ask. Even though we already know the answer without reading all the way to the end for the stunning conclusion which is—surprise!—no. We continue to believe that Apple will remain a core holding for growth investors. Phew! What a relief. Thank you for taking us on that pointless emotional roller coaster. Well, that was pretty good, but it's nothing compared to this one. Apple Inc Stock Split Decision May Cause Dramatic Fall in Stock Price to Below $100 Theoretically (tip o' the antlers to John Molloy). Yes, the International Business Times's Reissa Su makes the shocking discovery that a stock split could cause the share price of a company to go down! Inasmuch as division still works the same as it always has. The stock split will be completed on June 9 and Apple's stock price is expected to fall dramatically. According to analysts, if the stock split happened on April 23 with a closing price of $524.75, Apple stock would be trading at $75. CANCEL SELL ORDER! CANCEL SELL ORDER! So, congratulations to the International Business Times for a new low in jerktastic headlinery! Unless they just don't understand how stock splits work. The Macalope's not sure which one would be worse. Writing for CNN, Adrian Covert has seen the future, and it isn't Apple's. "Google Now and Cortana are the future, not Siri" (tip o' the antlers to Tay Bass). Cortana is the future! Literally the future, because it's not out yet; it's currently only available in a developer preview. What's particularly interesting about Cortana is how much attention Microsoft has given it. A company's interest in its own products is certainly fascinating, yes. The lack of contextual services is also what makes Apple's Siri feature more of a gimmick than a digital assistant. Except the iPhone does have contextual features, even predictive ones. If you have a favorite watering hole that you go to on Saturday night (in the Macalope's case, it's a literal watering hole), next time look at Notification Center before you go. The Macalope was surprised to see that his iPhone gave him the traffic time to the location. And Apple continues to make acquisitions designed to improve these features—just quiet acquisitions. Why all this attention to context and predictions? As new categories of technology, including wearable devices, grow more popular, services such as Cortana and Google Now will only rise in importance. But Apple's done in wearables. The battle's pretty much over. Stick a fork right in your wrist where your iWatch would one day have been. Contextual and predictive technologies, if done right, will streamline and improve the process of interacting with a phone, watch, headset, television and cars. Smarter software inside a car could help keep our focus on the road. IF ONLY APPLE HAD SOME KIND OF PLATFORM FOR CARS. With Google Now, Android-powered watches have the potential to determine where you are, and to a certain extent, what you're doing. And, really, isn't potential the same thing as shipping products that people use and love? How well this will work in real life remains to be seen. But just know that it's the future. That's what's important. It must be, it was in the headline. As cool as this not-so-distant future sounds, the thought of technology constantly tracking you and collecting data can seem a bit dystopic. Oh, really? You mean there might be some kind of hidden cost to using Google Now? That Google would happily sell your imortal soul to make an advertising buck? You don't say. Marcus Ash, the program manager for Microsoft's Cortana project, stressed how important it was to approach the issues of data collection and privacy with extreme sensitivity. Google stressed how important it is for you to log in so it can scrape every bit of information about you. So far, these services have avoided any of the major pitfalls that could detract from mass adoption of these technologies.